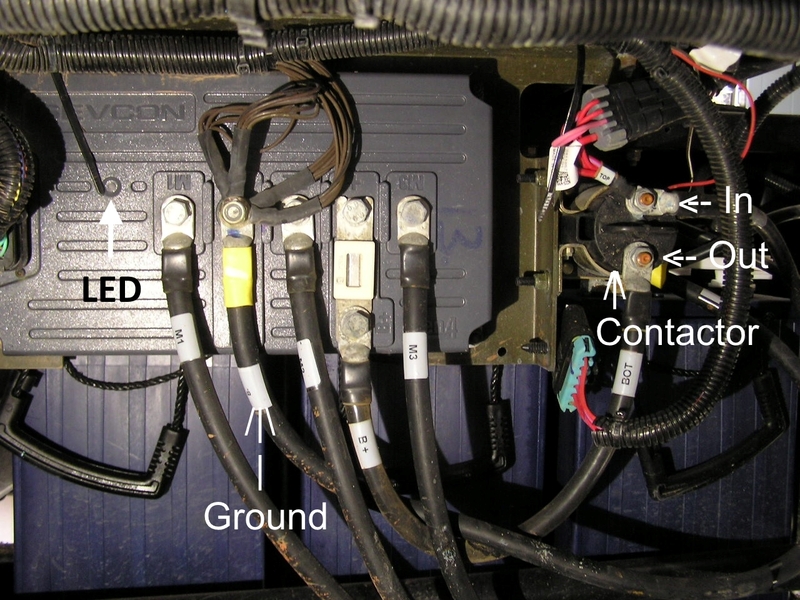 Measure the voltage from ground on the motor controller to the input on the contactor. With the key on it should be the same as the B+ terminal on the controller. them with pliers slightly and then slide them back on. When I tested this I pulled it off with key on... was a bad idea There was a small arc there, which I didn't expect at all. Yes I checked them earlier before posting this this morning. They are tension rings in the boots and one was not very tight so i squeezed it a little bitand it did better but no change. read my reply to Xfaxman. Thanks Xfaxman I returned home this afternoon and checked the cart. with the key on. At controller Batter- post to top post on solenoid i got 52V. From Battery- to Battery + post on controller i got 24V. Strangest thing happened?? All indicator light on dash were on but seemed dim so i thought what about the headlights. I checked them and they were dim or not on as i was viewing from being over the seat. I turned the key off and back on and heard the solenoid click and the turf mode selector clicked. Checked the voltage again as you described and now have same volts at both. The green light on controller is steady and wrench light went away along with the error orange light on the BMS guage. Put it F and it moved. R it moved. Like it never happened. Do you think I shoud consider replacing the solenoid as there may be a reason it sticked and may completely fail later when i could possible be stranded at camp. With the key off, check the resistance where the red arrows are in the picture below. Be sure the probes are on the bolt head and the stud, not on the cable connectors. This will show if there is a bad cable or poor connection. 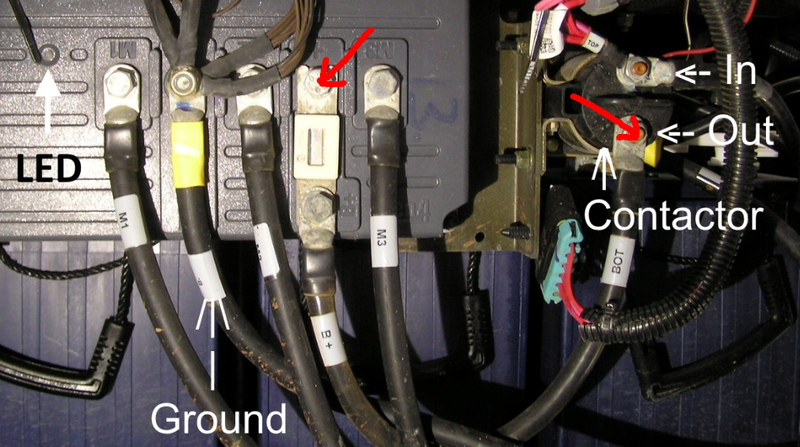 The contacts inside the contactor are the most likely cause. Some solenoid contactors can be taken apart and burnished, but replacement is the best option. and may completely fail later when i could possible be stranded at camp. Carry a jumper cable and jumper across the contactor. Same gauge as the main battery cable, 2 gauge. The nice thing about having a speed controller is that when contactor closes with vehicle at full stop, there is actually no current on it. Well I was thinking of car jumper cable set, but you would have to put one clamp on the other, to use both cables in parallel. If you make a jumper it would have to be the same gauge as what is there and other than big, I don't know what gauge it is. Another idea if there is enough thread, is to carry a wrench, remove both nuts, move the input cable over on top of the output cable and put the nut back on. There will be a spark so hold the cable tight while getting the nut on.